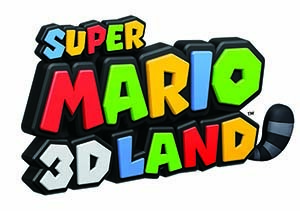 Buildable course inspired by Super Mario 3D Land which includes a new jump disk and launcher! Coins plus a star medal and a pop-up goal flag! It’s time for a brand new adventure. Bring the world of Mario to life with new Super Mario building sets, exclusively from K’NEX. Re-create your favorite levels from your favorite games as you battle enemies, collect coins and make your way to the goal flag. Collect them all to grow Mario’s world and go on an even bigger adventure. Go on a brand new adventure with Boomerang Mario as he enters a spooky Ghost House. 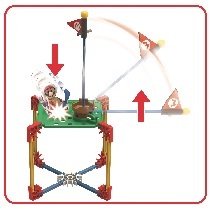 Featuring K'NEX's all new jump disk and launcher that allow Mario to run and jump, like he does in the game. Build Boomerang Mario and open the doors to enter the Ghost House. Use the jump launcher just inside to collect the hanging coins. Look out for the Boos - you can spin them using the red gear on the back. Use the appearing platforms to travel up to the second level, then use the sliding platforms to get past another scary Boo. Once you reach the top level, grab the Star Medal, but beware. Big Boo is spinning down a rod to get you. Jump down before he hits you, pop-up the goal flag and you've cleared the course. Combine your Ghost House building set with the rest of the K'NEX Super Mario building set line to take Mario on an even bigger adventure. For ages 8+. 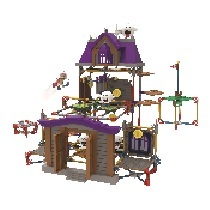 K’NEX’s exclusive rod and connector systems means that you can combine all of your Super Mario building sets to build bigger. You can also design your own levels, inspired by the games or from your own imagination. The Super Mario building sets contain all your favorite enemies from the series – Goombas, Dry Bones, Thwomps, Boos, Bowser and more. Collect all the sets to take Mario on the journey of a lifetime: Smashing enemies, collecting coins and saving the Princess along the way. Over the past 20 years, K’NEX has become America’s Building Toy Company with all of our bricks, rods and connectors manufactured in Pennsylvania at The Rodon Group’s facility. K’NEX and Rodon remain proudly family owned and operated. At a time when most toys are made overseas we are committed to manufacturing as many parts in the United States as possible. You'll be happy to know that every rod, connector and brick used in the Super Mario building sets is made in the U.S.A.